I would be glad to hear any comments or suggestions people have to make, after reading. Wherever they live, across the UK, older people should have the opportunity to live in resilient, thriving and sustainable communities and to emphasise the importance of the joined up thinking and collaboration between government departments if we really want to make that happen. 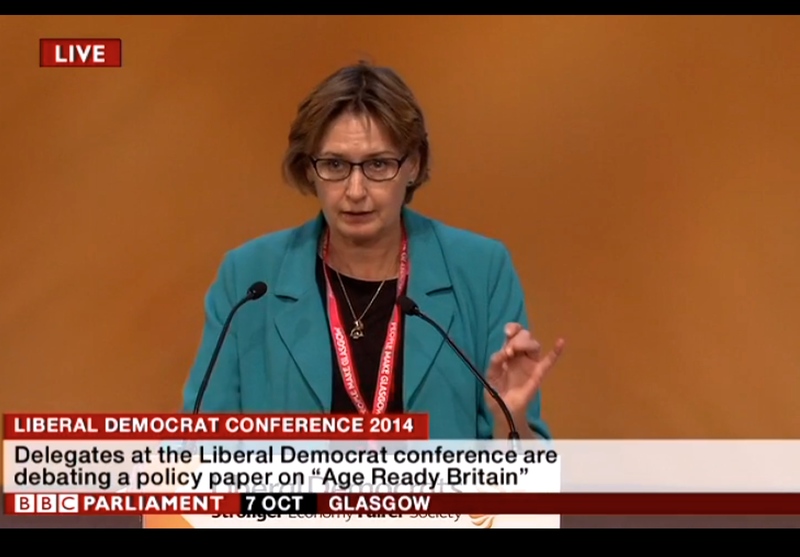 The policy motion passed at Conference, in Glasgow, recently, calls for us to be ready to create an Age Ready Britain. It states: “Liberal Democrats take an optimistic video of of ageing and the opportunities it presents.” I love this line. Retirement should be a time of discovery, of engagement and opportunity. Everyone should be able to feel optimistic about their old age, wherever they live. My mother is an optimistic pensioner and an inspiration. She lives in Hertfordshire, just close enough to London to enjoy good public transport and Mum is a wizard on the buses. Buses allow her to be independent, go shopping, to the doctors, to the library, to the church, to the choir, to see friends, to go to groups, talks, U3A – you get the picture. All possible, because regular bus services are available. Mum is 84 years old. In contrast, if you read my blog, you will have read about my meeting with Ivy in Ashmore Green, West Berks, a year or so ago. The day we met, Ivy had learned that her eyesight had deteriorated so much, she was not allowed to drive any more. She had been looking into the bus services and told me, “I can get to Tescos in Thatcham on the bus, alright. The only problem is, I have to spend the night there”. The only return bus left half an hour after she could be dropped off and, Ivy said, at 84 years old, she just can’t shop that fast. I sat in on a Health and Wellbeing Board meeting in Lambourn, recently, and heard about how resources for older people were likely to be closed down and moved to Hungerford. Six months before, during the Hungerford by-election, I’d spent time speaking with residents on the Fairfields estate. All the residents who were over 65 were about to be moved to a shiny new facility on the edge of the town. So resources are being moved into town, while old people are being moved out. You couldn’t make it up. The number of older people living in our area is increasing fast. West Berkshire is home to more than 23,500 people who are over 65 – a figure that increased by 23% between 2001 and 2011 – double the average increase across Britain. Of this group, 3,300 people are over 90 years old – a figure that went up by 34% in the same period. We need to keep facilities where people live, to house people where the facilities are, or to provide regular, reliable transport so that people who are too old to drive can continue to live full and active lives for as long as possible. To create thriving and sustainable communities that work for older people there needs to be some manner of better public transport. Regular, reliable, affordable. But how can we possibly afford such a service? Each year the government awards a local government settlement to local authorities across the country. Not every authority receives the same amount and, on average, urban areas receive £153.47 more per person than rural areas. This constituency has a population of about 98,000 people. Multiply that by £153.47 and you get just over £15 million. A useful chunk of change, as they say. I have no doubt that calculations behind the local government settlement have sound bases. There are issues with deprivation in some cities that need special consideration. I would like to ask, however, whether the new, ageing demographic of the UK is being fully considered, as well, when these calculations are made. I don’t want a fancy rural grant for this or a specially negotiated subsidy for that. ‘m not asking for special favours for countryside communities. All I want is fair’s fair for everyone, wherever they happen to live. When people stay active, they stay healthier – and happier – for longer. An active, older, society offers a group of individuals who are often happy to engage, to volunteer, to help each other. So long as they can get about. When you are trapped in a block of flats a couple of miles or more from any active community, how are we honestly expecting people to cope? The Policy passed at conference calls for the creation of a Minister for Ageing. When they are created, I call on them to engage with the Department of Local Government, the Department for Work and Pensions, the Department of Transport and DEFRA, with its responsibility for rural communities. If I’m elected to Westminster I will work for and campaign for joined up thinking between government departments, joined up public services, joined up action – which is the only way to enable the resilient, thriving and sustainable communities we all want, for older people.